Katherine Harrell is a Licensed Marriage and Family Therapist who works with children, adolescents, and families as well as individuals who seek to regain emotional-relational health. Her areas of interest include working with survivors of trauma, neurodevelopmental disorders (Autism Spectrum Disorders, ADHD), adoption and permanency and other attachment disruptions, and coping with challenging transitions. Katherine also specializes in supporting queer and non-traditional families, and is a member of the LGBTQ+ Therapists Network in the Twin Cities. 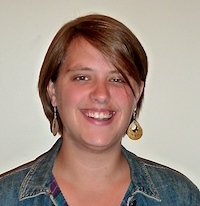 With children, Katherine uses a variety of play therapy interventions. Through play, Katherine believes that kids are engaged in serious work and learning. Katherine views therapy as a personalized classroom; a space for children and families to learn more about themselves and their connections to one another. In every session, she aims to heighten emotional awareness, and highlight the client's and/or the family's strengths. Katherine approaches her practice through an intersectional lens that promotes the radical acceptance of all parts of a person's identity. Katherine's vibrant and expressive personality creates a warm hospitality where families can feel safe. Katherine can be reached directly at 612-888-6951.